Well that was a 10hr journey from hell getting to Kathmandu: No breakfast, crappy stops along the road and massive traffic jams meant we arrived in Kathmandu 10hrs later feeling dirty and grumpy...but it was hard to stay grumpy when you reach the small flagged streets of Thamel, with all the little shops and the constant smiles and calls of Namaste. It then turned out the guesthouse we were meant to stay in had given our deluxe double room to the previous occupants and as we were in no mood to settle they moved us to a much better class of hotel around the corner! Bonus!! 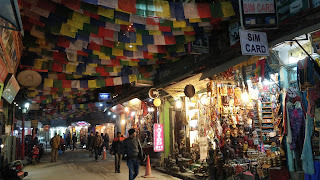 We had opted to stay in Thamel purely for cost reasons, as it's a slightly cheaper neighbourhood, but honestly it was a quirky little haven full of hippy clothes and knick-knacks, great food venues and cool bars and I wouldn't have wanted to stay anywhere else. We quickly found the best bar in town (thanks to Paul's friend Russ), and that became our 'go to' venue at night. Mainly for the roaring oil drum fire which was a much needed source of heat in the chilly evenings but also for the random people and chats you got round it, (one of the funniest being Pratik, who was convinced Paul sounded like Michael Keaton!!). Most of the days went by with lazy mornings, coffee or beer in the cafes in the little streets, reading, or shopping for things we didn't have room for, but we did get out to the neighbouring district of Patan. Catching the bus there was 'fun' as there are no English signs and no real bus stops to speak of. You have to wait until you catch one of the bus conductors (generally very young looking lads) shouting the name of the town you want to go to, or ask all of them until you get the right one. Our bus was actually a mini bus, but he bundled it full of people and off we went. Turned out it didn't really go to Patan but it went close enough, so on their instruction we jumped out and walked the rest of the way. 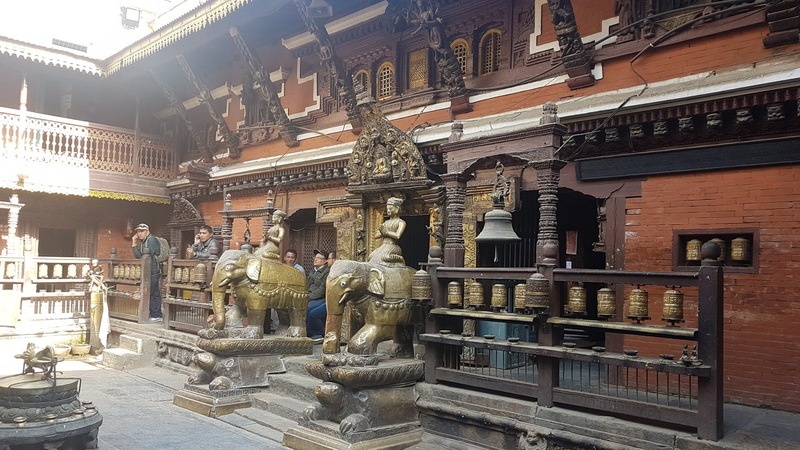 First stop the Golden Temple, which is a 15th Century temple, tucked amongst a very normal looking street but once inside it's a beautiful square temple with old blackened wood and ornate carvings covered with gilded metal plates that glisten everywhere. 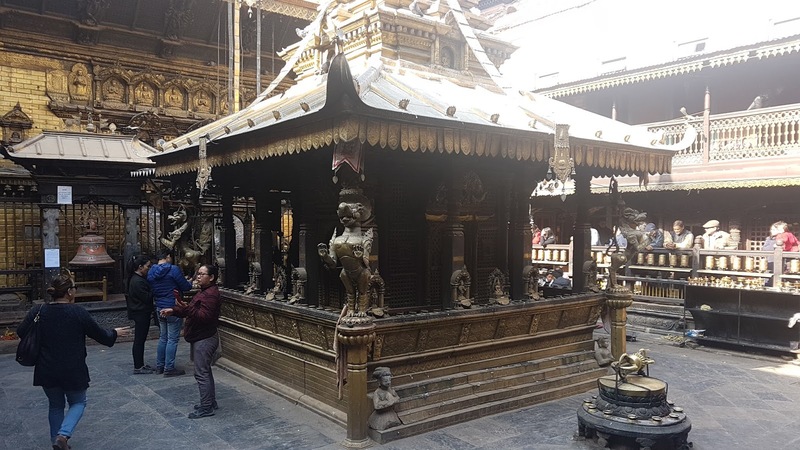 After we went for a walk via Durbar Square which unfortunately was heavily damaged by the earthquake and is still under a lot of scaffolding. It was lovely to stroll past such beautiful architecture, but sad to see the rumble and lasting reminders of such a terrible disaster. 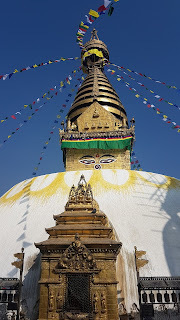 One sunny morning we decided to walk to Swayambhunath stupa. It's only about 40 mins walk from our hotel but it's then up a further 350+ steps from the road, nestled on a hill overrun with monkeys. They actually didn't pay us any attention at all, far more interested in clearing up the rice offerings and chasing each other around the golden buddhas. At the top of the steps you have an amazing view of Kathmandu and the huge white and gold Stupa plus we were lucky enough to have the Buddhist monks doing some chanting when we arrived. Aside from Sam's bar, there were a few other stand out places we ate and drank at. The Bar with no Name deserves a mention because it was such a hidden little gem with the best humous platter, craft beer and super fast Wi-Fi, plus we had such a long power cut there they had to get the candles out. The 4th floor hipster restaurant Forest and Plate was the best place we ate at whilst in Thamel (£28 for 3 courses and 1 cocktail each), seriously the best Panna cotta I've ever tasted! It was bound to happen at some point in our trip and this time was my turn as Friday night I got a severe case of food poisoning. I had actually really enjoyed my previous dinner and as it was a highly rated place on trip advisor, with a spotless kitchen I'm sure this was an unusual occurrence. Anyway that was me holed up in the hotel for the next 48hrs... Fortunately they had cable TV and Paul went out for provisions. Our final port of call was Boudhanath Stupa, which is one of the largest stupas in Nepal. A huge white spherical dome, amid a courtyard lined with shops, cafes and galleries and hundreds of prayer flags fluttering in the wind, accompanied with the now standard Tibetan chanting soundtrack... It's quite magical. 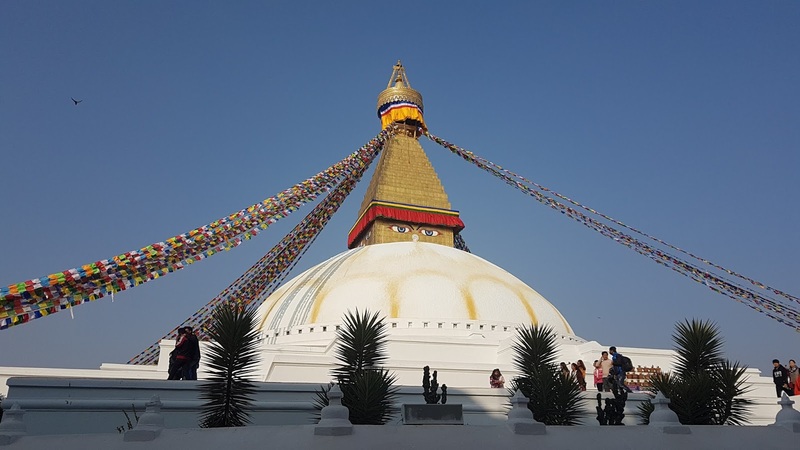 With that our time in Nepal is over and whilst I love this country with its stunning views, beautiful architecture, amazing food and friendly people I'm looking forward to moving on and being able to ditch the fleece. 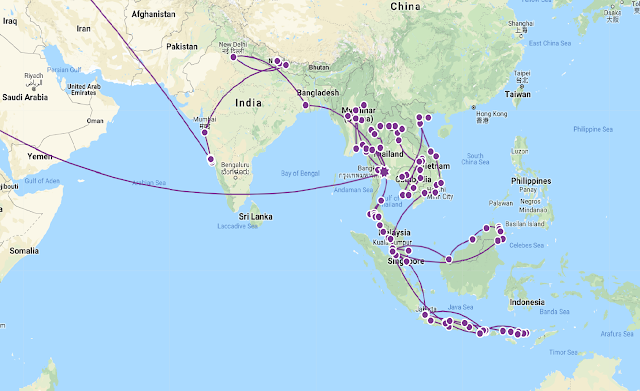 Off back to India again for a week, first stop is Delhi.